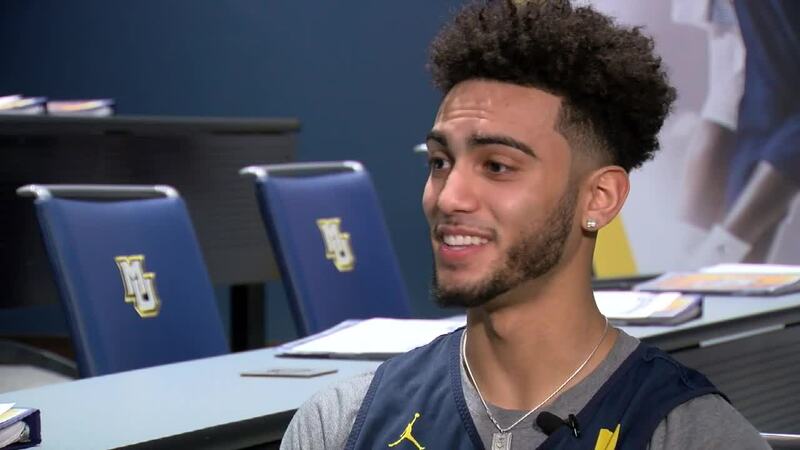 MILWAUKEE — Markus Howard has had a special season playing for Marquette. To him, it's all because of one thing: his faith. "You wear the number zero for a reason. Why?" TODAY'S TMJ4 main sports anchor Lance Allan asked. "When the opportunity presented itself, that I could get the number zero, I was thinking what could it mean, (what) ties into my faith. The first thing that came to me was without God I'm nothing." When asked about David and Goliath and if that biblical story means anything to him, Howard responded emphatically. "Yeah! That's my sling shot. That's my knockout punch." Howard lives out his faith, on and off the court. In the offseason, he went on a mission trip to Costa Rica. "That was definitely the hardest physical task I've ever had to do. In my 19 years of life, that was the most unforgettable experience I've ever had," Howard said. This experience led to Howard starting the first Fellowship of Christian Athletes chapter on Marquette's campus. "Something that's really important, especially with athletes, is admitting that they're vulnerable. I think when you admit that you're vulnerable to other people, other people who care about you, that builds a trust factor," Howard said in response to starting the group. Howard's faith is his biggest motivation, but there is also the driving history that comes with being a part of Marquette basketball. "Just being here each and every day, you can feel the history. You can feel the tradition. To see guys like Travis Diener, who was here in our program, you know as a coach, Dwyane Wade, who is here all the time," Howard said. Clearly Howard is comfortable at Marquette and in his own skin. "The 3 (tattoo) represents us three brothers. I also have Philippians 4:13. 'I can do all things through Christ' on my other wrist," Howard said. Just named the Big East Player of the Year, some wonder what Howard's Marquette future holds. "I don't really pay much mind when people say stuff like that because I like to focus on the moment. I know that what's important is the task at hand. That is trying to make sure that we, as a program here at Marquette, have the best season we can." Markus Howard's life and career all point to one thing. After asked why he'll occasionally point to the sky, Howard responded, "Knowing whatever happens in the game, whether good or bad situation, the glory always goes to God."